The 2016 David N Schramm journalism award. A wind blows from a supermassive black hole, profoundly affecting everything around it for tens of thousands of light years. I am very honored to let y’all know that I have received the David N. Schramm Science Journalism Award for 2016! The award’s namesake, David Schramm, was an astrophysicist who studied the Big Bang. Much of his research involved how the lightest elements (hydrogen, helium, and lithium) were created in the first few moments after the birth of the Universe, and how those would affect other properties we see in the cosmos today. I never met him, but I wish I had; he sounds like he was an interesting fellow. If you want the answer, click through. I had a lot of fun writing that article. 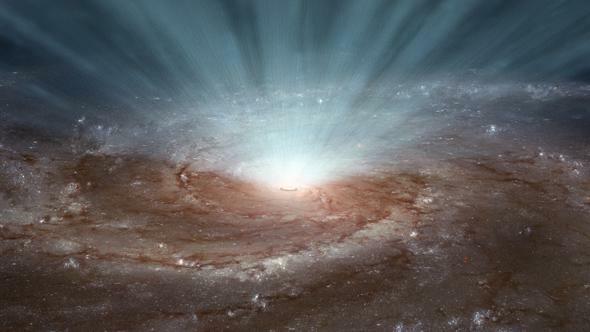 It covers a big, sweeping topic—why the sizes of gigantic black holes are apparently tied to the large-scale behavior of galaxies, which isn’t at all obvious—and uses new findings to help answer a question that had been bugging astronomers for years. The field of high-energy astrophysics doesn’t have a hard and fast definition, but it covers objects and events that can generate high-energy light at the top of the electromagnetic spectrum: X-rays and gamma rays. These are among the most violent events in the Universe: exploding stars, colliding galaxies, gamma-ray bursts, black holes gobbling down matter, newly formed neutron stars glowing fiercely hot, and the like. I’ve always had a love for such brain-crushing events—probably spurred on by watching disaster movies as a kid. I never did scientific research in high-energy astrophysics per se, but I was involved in the field for many years. Back in 2000, I left my job working on Hubble Space Telescope to move to California and be a part of the Sonoma State University NASA Education and Public Outreach group, headed by Lynn Cominsky. We developed educational products based on several NASA high-energy missions like Fermi, Swift, NuSTAR, XMM-Newton, and more. It was (pardon the expression) a crash course on high-energy astrophysics, and I had a chance to learn so much about all these amazing astronomical objects and events from some of the top men and women in the field. I wrote tens of thousands of words for the Web, brochures, classroom activities, grant proposals, and even games we created. This was all in the service of educating teachers, students, and the public about the high-energy Universe, but it also filled a need in my own brain to find out as much as I could about all this fascinating science. Whenever I write about black holes or gamma-ray bursts now, I’m reminded of my time learning about them back then. It’s nice to be able to tie together different times in my life and use them to help me in my writing. I am deeply honored to accept this award, especially because it comes from my peers in the writing and scientific community, and I thank them sincerely.